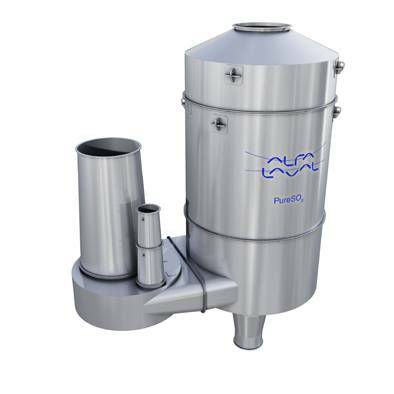 The order intake for the Alfa Laval PureSOx scrubber system continues to intensify as January 2015 approaches. Four PureSOx systems have now been ordered by Finnlines, a leading provider of RoRo and Ropax services, whose Baltic Sea and North Sea operations will soon fall within an Emission Control Area (ECA). RoRo and Ropax vessels from Finnlines offer services from Finland to Germany, North Sea Ports, Spain and via the Åland Islands to Sweden, as well as from Germany to Russia. Following a recent order, four of the company’s existing RoRo vessels will now be equipped with PureSOx scrubber systems from Alfa Laval. Alfa Laval will fulfil the Finnlines order in late 2014. Retrofits of the RINA-classified Finnhawk, Finnkraft, Finnmill and Finnpulp will be conducted at yards in Northern Europe, with installation and commissioning taking place from December 2014 to January 2015. Although the vessels all have four-stroke engines from MAN, their PureSOx configurations will differ somewhat. On the Finnhawk and Finnkraft, which have single engines of 12.6 MW, single-inlet scrubbers will be used. The Finnmill and Finnpulp, which each have two engines of 9.45 MW, will instead have multiple-inlet scrubbers. “Having multiple inlets will allow us to reduce the space and equipment requirements aboard the Finnmill and Finnpulp by using one scrubber to handle both engines,” Diks says.